GRAND RAPIDS April, 21, 2015– The West Michigan labor community, partnered with Heart of West Michigan United Way, held its April food truck at City Life Church in Grand Rapids last week, where 127 families received food. The size of the average household this month was just over three, which means more than 420 individuals received help. 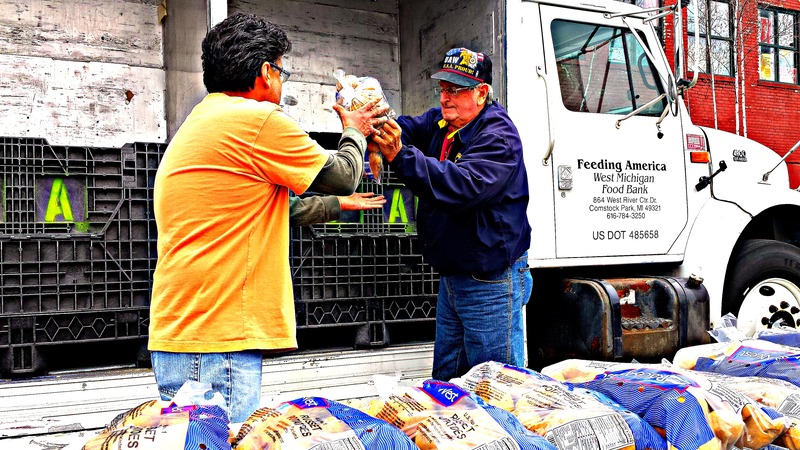 Every month, west Michigan labor unions sponsor a Feeding America food truck to distribute 5,000 pounds of produce and baked goods to local families suffering from food insecurity. Union members, retirees and community members then volunteer their time to pass the food out at an area church. Next month’s food truck will take place on May 21 at Plymouth United Church of Christ, 4010 Kalamazoo Ave SE in Grand Rapids. For more information on the food truck program, click here. This entry was posted on April 21, 2015 by WMALC in Community service news and tagged church, Feeding America, Grand Rapids, United Way.